The Chinese satellite DAMPE is the newest high-energy particle detector in space. Detector read-out integrated circuits from IDEAS are enabling DAMPE to search for the elusive dark matter. The DArk Matter Particle Explorer, or DAMPE, was launched from the Jiuquan Satellite Launch Center in northern China on December 17th 2015. 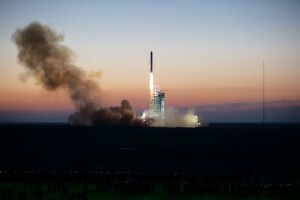 The 1900 kilo heavy satellite was lifted into a sun-synchronous orbit at an altitude of 500 kilometers. The new satellite is one of five planned by the Chinese Academy of Sciences' Strategic Pioneer Research Program in Space Science. The University of Geneva in Switzerland and the universities of Perugia, Bari, and Lecce in Italy are the other European partners in the DAMPE collaboration. DAMPE is capable of detecting gamma rays, electrons, ions, protons and neutrons. The four instruments on board are able to measure the type, energy, and direction of high-energy particles (http://dpnc.unige.ch/dampe/). Thereby the DAMPE scientists will gain insights into the mysterious nature of dark matter. Only about 5 percent of the mass in the universe is normal matter, such as planets, stars, and galaxies. The rest consists of dark matter and dark energy. Scientists observe effects that are attributed to dark matter and dark energy, but it is still a mystery what dark matter and dark energy really is. Integrated circuits developed by Integrated Detector Electronics AS (IDEAS) are enabling DAMPE to search for dark matter. “We have designed integrated circuits for the front end electronics of three of the four instruments aboard DAMPE”, says Gunnar Mæhlum, CEO of IDEAS. These are the Plastic Scintillator Detector, the Silicon-Tungsten tracker, and the BGO Calorimeter. The Oslo-based company has delivered integrated circuits to other projects and scientists at the Chinese Academy of Sciences, the Purple Mountain Observatory in China, and to the European partners in the DAMPE collaboration. IDEAS has also delivered integrated circuits to the US particle detector AMS-02 (http://www.romsenter.no/Aktuelt/Siste-nytt/Partikkeldetektor-i-rommet-skal-loese-universets-mysterier) and the Japanese particle detector CALET (http://www.romsenter.no/Aktuelt/Siste-nytt/Gammaglimt-svarte-hull-og-moerk-materie), mounted on the outside of the International Space Station. Technology from IDEAS has flown on several American and European space missions, and more will follow. One of these is the ESA JUICE mission (http://www.romsenter.no/Aktuelt/Siste-nytt/Med-norsk-teknologi-til-Jupiter), which will be launched to Jupiter and its moons in 2022, and carry a calorimeter with integrated circuits from IDEAS. With IDEAS' experience in designing integrated circuits for particle detectors in space, the development of the technology for DAMPE was completed in a very short time. “We had a very short development cycle: it took less than a year to develop the circuits”, says Mæhlum. 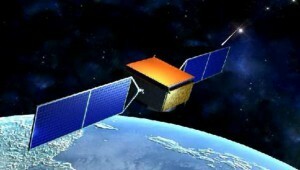 The DAMPE satellite had a successful commissioning and has already begun detection of high-energy particles in space. There are currently four dark matter detectors in space: AMS-02, CALET, DAMPE, and Fermi. IDEAS has delivered integrated circuits to three of these four dark matter detectors. “I won't try to guess which detector will be first to solve the mystery of dark matter, but IDEAS has three tickets in the lottery”, Mæhlum says. Norsk versjon med bildetekst og bilderettigheter er her. Chinese satellite with Norwegian technology. 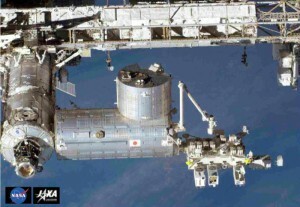 Physics experiment CALET sits (far right) outside of the Japanese laboratory module Kibo on the International Space Station. From near Earth, CALET investigates cosmic radiation and its sources. Photo: NASA / JAXA. 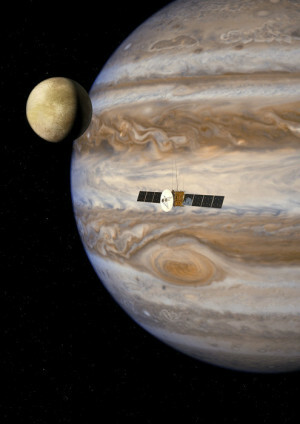 The European spacecraft Juice will examine Jupiter and three of its icy moons, Europa, Callisto and Ganymede, with Norwegian technology on board. Graphics: ESA / AOES.